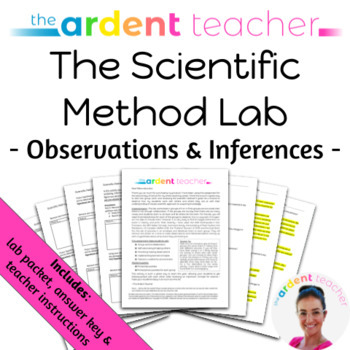 This introductory lab helps students practice their ability to make observations, inferences and hypothesis all while practicing the scientific method. I would suggest doing this lab in groups of 3 or 4. 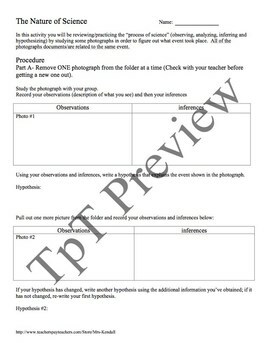 You will need pictures to accompany this lab. In the past I have give all of the students the same set of pictures, and most recently I have given each group different sets of of pictures. Due to copyright of images I am not including them. However, it is very easy to find a set of 10 images from an event in history and print for yourself (this way you can also choose what you want your students to be studying whether it be local history/events etc or even specific to your subject matter). Most recently I have used: 1906 Earthquake, 1957 Dallas Tornado, Hurricane Sandy, Pearl Harbor, San Diego Fires 2007, Thailand Tsunami 2008, Dust Bowl. I truly hope you enjoy it! I know that I always do, as do my students!